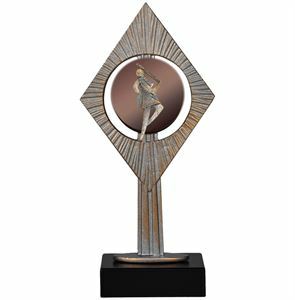 At Impact Trophies & Medals, we offer a great range of majorette trophies, medals and awards suited to any majorettes display, event or competition. Our extensive range includes majorette trophies and star awards for majorettes. 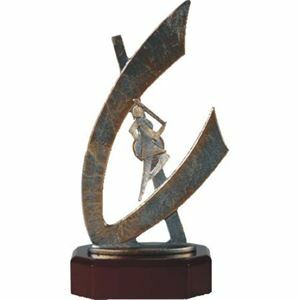 Impact Trophies & Medals are a leading retailer of majorette trophies & awards. Great for personalisation, many of our majorette star trophies and handmade majorette awards can be personalised with free self adhesive engraved text plates and printed logo inserts, to perfectly meet all your majorette event or presentation needs. 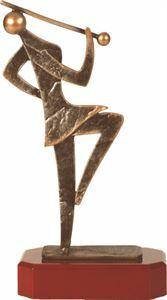 The Mini Star Majorette Trophy features a majorette dancer in full costume, set in front of a golden star. 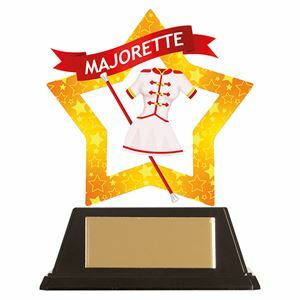 Made from resin and coated for a high shine finish, this fantastic majorette trophy also displays a 'Majorette' banner. 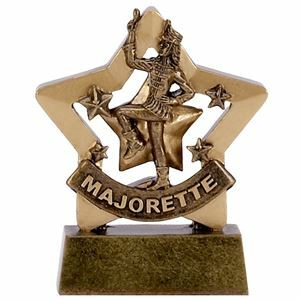 A great little award for recognising the efforts of any deserving majorette troupe, this brightly coloured, durable trophy offers great value for money. The star shaped plaque has been precision cut from a clear, polished acrylic and UV printed with the image of a majorette uniform and baton. The plaque is edged by a golden frame and topped with a red banner reading MAJORETTE in white lettering. Supplied with a black trophy base, the star plaque neatly fits on top creating the stylish Mini-Star Majorette Acrylic Plaque. The modern Majorette Diamond Plaque Trophy is set on top of a black wooden plinth. The trophy features a vertical diamond shaped plaque decorated with etched lines, with a copper coloured disc inset into the centre with the image of a marching majorette set onto it. Handcrafted in Belgium, the Sandstone Pillar Majorette Trophy features a 2D majorette with baton framed in a ring and mounted on a rugged sandstone plinth which takes a FREE personalised text plate. The award is forged from high grade pewter and coated in a bronze glaze. The majorette is burnished in a blue copper finish. This offer is for a bulk purchase with a minimum order quantity of 3 trophies. The stylish Majorette Boot and Hat Pewter Trophy is crafted in Belgium from premium materials. 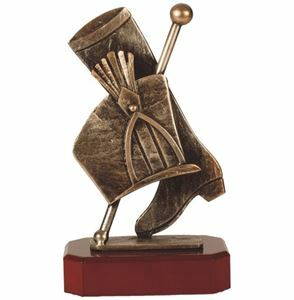 Mounted on a glossy rectangular base the trophy features a boot, hat and baton, precision cut from solid pewter and displayed on an angle. 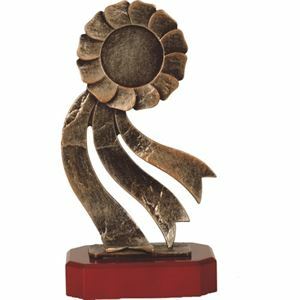 This versatile bronze glazed trophy features a rosette cast from solid pewter, set upright on a polished wooden plinth. Made in Belgium by specialist award makers, the Pewter Rosette Trophy would make an exceptional award for a number of different events and is a great way to recognise outstanding achievement. This contemporary award has been made in Belgium and forms part of our European Designer range. 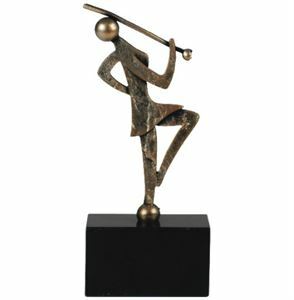 The Majorette Figure Pewter Trophy displays a marching figure holding a baton and is made from bronzed pewter and is mounted on a glossy wooden plinth. 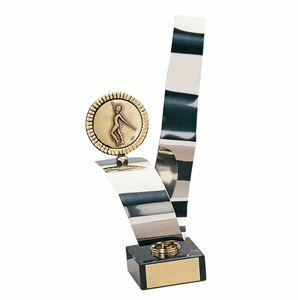 Mounted on a solid black marble base, this Majorette Handmade Silver Metal Strip Trophy features a highly polished silver ribbon of wavy metal, formed into a V shape. The award is hand crafted from high grade metal to produce a quality award, the glossy surface creating an eye catching effect. 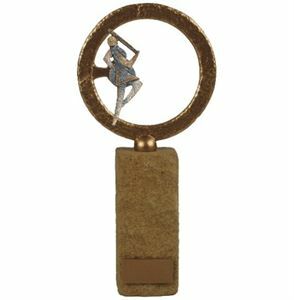 The award features a circular gold trimmed disc, displaying the image of a female majorette.